At the end of last week, a reader of ours pointed out that device made by Motorola under the model number XT1254 had passed through Bluetooth SIG with a description confirming that it was an Android smartphone. No other details were attached, so we ignored it. Then over the weekend, a couple of supposed CPU-Z screens of a Motorola device with a codename of “quark_verizon” surfaced under the same model number, causing the tech world to freak out, toss around conspiracy and fanboy theories involving the rumored Motorola Nexus, and generally sound silly. 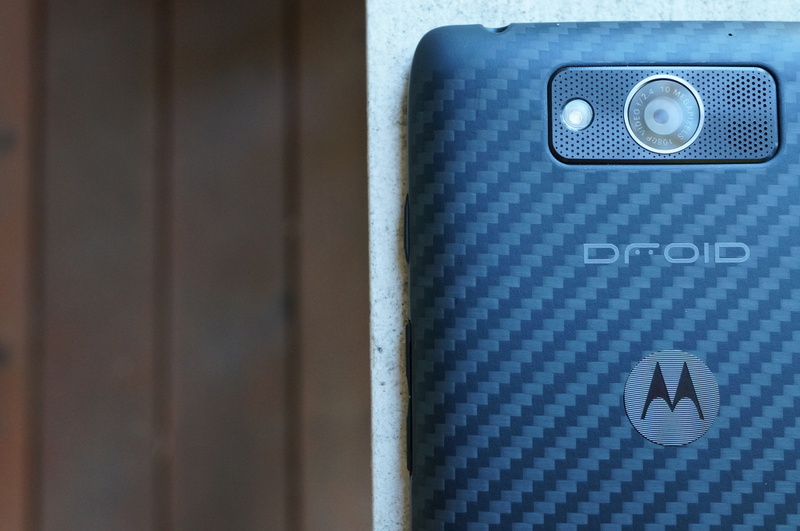 Names like “DROID Turbo” were mentioned, as were a handful of next-level specs. So what is this mystery device? Well, let’s see if we can’t find out. 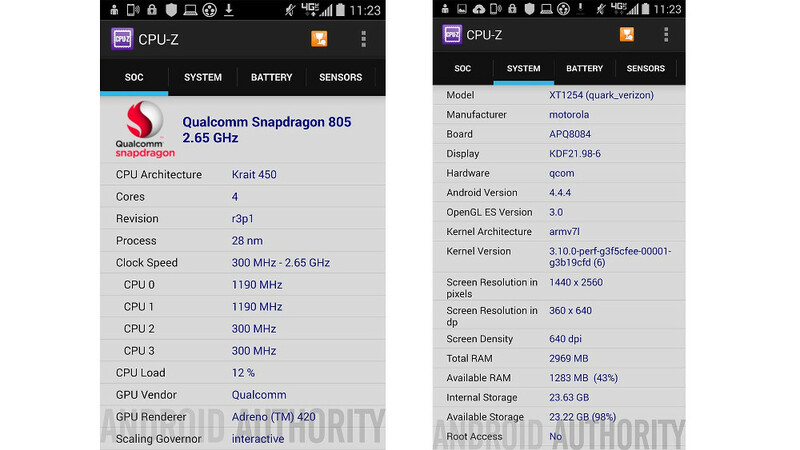 The CPU-Z screens with the name “quark_verizon” first surfaced through Android Authority, along with a couple of extra details. The benchmarks show a device running a Qualcomm Snapdragon 805 clocked at 2.65GHz, Adreno 420 GPU, 3GB RAM, 24GB of available storage (likely 32GB total), Android 4.4.4, and a display with a resolution of 2560×1440 (640×360 dpi, edit: display size is unknown). They also tossed out the potential name of “DROID Turbo” and the device having a 20MP rear camera, thanks to “anonymous” sources. As previously mentioned, the codename “quark_verizon” and model number XT1254 are also shown. If you didn’t notice, the “4G LTE” logo in the notification area is indeed Verizon’s. Much like last year’s DROID line, this phone does not appear to have on-screen navigation buttons. As can be seen by CPU-Z screen, the resolution of the display is a full 2560×1440. If there were on-screen buttons, that would show as something like 2392×1440, like it does on the LG G3. You also can’t see the on-screen buttons, which do show on devices that have them with CPU-Z open. Motorola, like most manufacturers, has always tried to keep model numbers in order from year-to-year and from device-to-device. For example, the Moto X last year carried model numbers of XT1053 (unlocked/T-Mobile), XT1056 (Sprint), XT1058 (AT&T), and XT1060 (Verizon). The DROID MAXX and ULTRA live under model number XT1080, while the DROID Mini is the XT1080M. The original DROID RAZR was the XT912 and the RAZR HD was the XT926. We have also seen unreleased Motorola devices under the model numbers XT1096 and XT1097 show up within the last couple of weeks. These are largely thought to be variants of the new 2014 Moto X. So what is the XT1254 then? We haven’t seen a Motorola model number close to XT1254 yet – this is a massive and surprising jump in the sequence. The only thing we know from looking at this, is that it is a Motorola device headed for Verizon (thanks to the codename). But with such a large jump, is this a phone that is months and months away from a potential release? Digging for a couple of hours around the web over the last couple of days has returned nothing new on this XT1254 device. It clearly just showed up for the first time within the last week. The now-retired @evleaks pointed out back in February of this year that Motorola was busy during Mobile World Congress “working on the Quark X.” He didn’t elaborate on what that meant, as far as I can tell, but that shows you how far back the name existed. Since then, there have been no new mentions of this codename. The name “quark” has even more meaning, though, if you do a little bit of research. Intel has an entire line of mobile processors that fall under the name “Quark.” These processors, at least their highest end models, are expected to ship in Q2 of this year. However, these processors are generally thought of as made for smaller, low-power devices like wearables. Clearly, the device depicted here is not a low-end wearable or powered by an Intel chipset. Was @evleaks referring to the new Moto X? Was he referring to a new DROID, but didn’t know it? We have zero answers there. What about the Moto X vs. this phone? The oddest thing about all of this is the level of a phone we are talking about. Let’s assume this is a new DROID and it does indeed run a Qualcomm Snapdragon 805 with tons of RAM and a Quad HD display. The new Moto X, which is Motorola’s flagship for 2014, can’t even stand up to those specs, assuming the benchmarks we have seen are correct. The Moto X is thought to have a 5.2-inch 1080p display, Snapdragon 801 processor, and 2GB RAM. Are you telling me that Verizon worked a special deal to release a DROID-branded phone that stomps all over the Moto X? Seems odd, but hey, you never know. 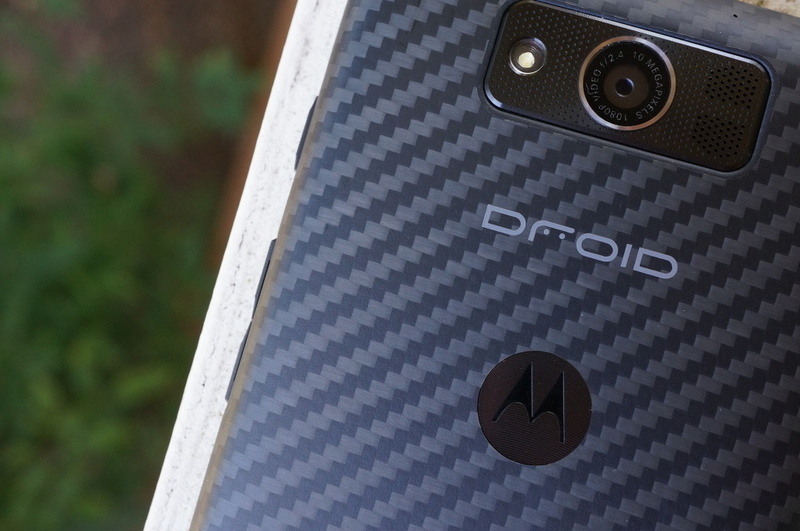 They did manage to release last year’s DROID line a couple of weeks before Motorola unveiled the Moto X, even though those phones were the Moto X in DROID disguises. Then again, that whole situation only matters if this phone is released any time soon. For all we know, it could be months out. DROID line is a mystery. Last year, Motorola and Verizon announced that going forward, Motorola would have the exclusive to their exclusive on DROID devices. Until we hear differently, we have to assume that Verizon is still fully committed to the DROID line, only we have heard nothing on a DROID front so far this year. We know that Motorola is going to announce a new Moto X and Moto G on September 4, while giving us launch details on the Moto 360. But what about new DROIDs? We haven’t had new ones since last year’s launch of the DROID MAXX, ULTRA, and Mini, so it’s about time for replacements. Is the XT1254 one of them? Maybe, maybe not. As of today, the “DROID Turbo” and XT1254 are nothing but a Bluetooth SIG listing and an anonymous benchmark. Should we happen upon additional details, we will be sure to pass those along.